This seems to be another houseplant with an identity crisis, and it's largely due to the fact that it's a cultivar--a cultivated variation of a plant that's been bred to bring out desirable qualities. 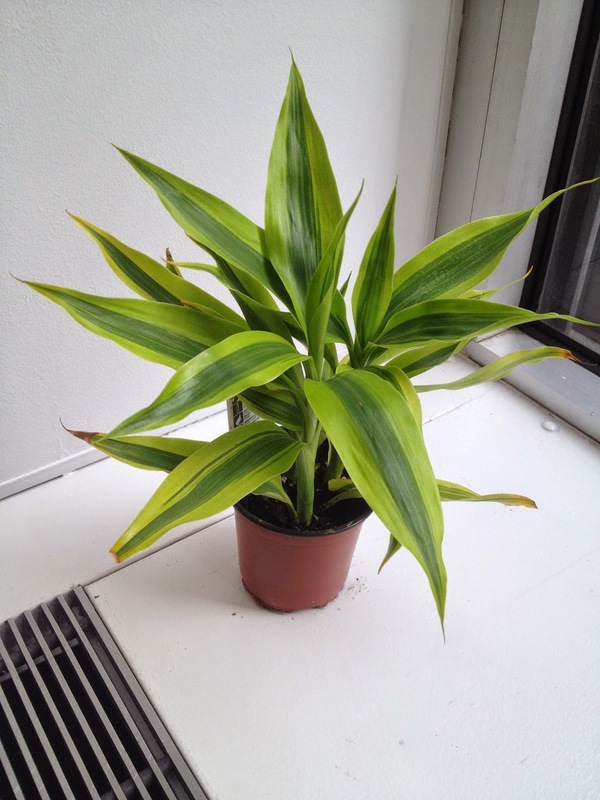 In the case of this plant, it's in the genus of dracaena. Dracena, which comes from the Greek word meaning "female dragon" is a genus with about 40 different species that are native to Africa and parts of southern Asian and Central America. This particular plant is in the species d. fragrans, also knows as d. deremensis. It's been bred to contain an attractive pattern and given the name "Warneckii". They also call this particular variation "limelight" after the color of the leaves; while other variations are completely green or have white stripes, this one has a beautiful dark green color in the middle and light, lime-color on the outside, resembling the colors of a lime. This plant is closely related to other houseplants on the list such as the corn plant, which hopefully I'll be writing about soon. The plant originated in Madagascar and thrives in other areas of tropical Africa such as Sudan, Mozambique, the Ivory Coast, and Angola. As with many tropical plants, it makes a great houseplant because it can survive brutal conditions and neglect. It likes medium light, but can tolerate direct sunlight as well as low light conditions. As just one example, after I bought this particular plant I left it inside a plastic bag and unwatered for about a week, but lo and behold, the leaves didn't even start to wilt or turn brown. As for air cleaning qualities, this whole genus of plant is a rock star, and is especially good at cleaning benzene from the air. According to the Center for Disease Control, air in general contains benzene from a large variety of sources, including tobacco smoke, gas stations, motor vehicle exhaust, and industrial emissions. Indoor air contains higher level of benzene than outdoor air, because in addition to all those sources you also add benzene found in glues, paints, furniture wax, and detergents. Even low levels of benzene exposure can cause symptoms such as dizziness and headaches. With long-term exposure, it can cause harmful effects on bone marrow, decrease red blood cells, negatively affect the immune system, and lead to cancer or leukemia. In Dr. Wolverton's ranking, this plant has a 6/10 effectiveness in clearing chemicals from the air and 8/10 transpiration rate, meaning that it can create relatively substantial air movement as water evaporates from its leaves. Care and feeding: Keep the soil evenly moist. Feed during the summertime but not in the winter. Water less often during the winter. If you like the look of my lemon and lime colored Warneckii, you can shop your local garden store or find great ones on eBay .